Liverpool's Luis Garcia and West Ham's Hayden Mullins are set to miss the FA Cup final after being sent off in Wednesday's dress rehearsal. 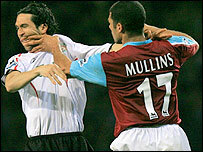 Garcia appeared to aim an elbow in Mullins' back before going to ground after a shove by his rival as they jostled for the ball after 82 minutes. Earlier, Cisse had powered in an angled 20-yard drive to put the Reds ahead. 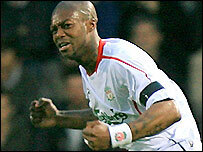 West Ham responded when Nigel Reo-Coker tapped in before Cisse squirmed a shot home to earn the visitors a win. West Ham were playing their first home game since the death of former manager John Lyall and there was a period of applause before the game got underway. Striker Bobby Zamora had an early chance to give the Hammers the lead when he latched on to Yossi Benayoun's angled ball only to take too long over his shot and see it blocked. Cisse had a powerful effort shot parried and gathered by keeper James Walker at the other end in what proved a warning the home side failed to heed. Reds midfielder Momo Sissoko produced a powerful run from midfield and found Cisse, playing in the left midfield slot, and the Frenchman unleashed a low strike past Walker at his near post. Robbie Fowler chipped against the crossbar while Cisse had another long-range effort as the visitors threatened to extend their lead. But the Hammers ended the half strongly and almost levelled when Teddy Sheringham headed agonisingly wide from Anton Ferdinand's right-wing cross. An unmarked Benayoun could not control a bouncing cross for Zamora and headed over at the far post just before the break before the home side equalised the other side of the interval. Zamora played a neat one-two with the astute Sheringham before crossing for Reo-Coker to tap in from six yards. The match was a more open and entertaining contest as both sides showed an attacking mentality and Fernando Morientes flicked a volley on to crossbar for Liverpool. Cisse put the Reds back in front again when he raced on to Fowler's through ball to squirm a shot through the legs of Walker. Matthew Etherington had an effort well-saved by Reds keeper Jerzy Dudek and Fowler nodded just wide as the two teams traded chances. But then Mullins and substitute Garcia were both sent off for violent conduct and, with the offence carrying a three-match ban, they are set to miss the Cardiff showpiece between the two teams. "I think everybody in the whole stadium was hoping the referee would not brandish the red cards but, unfortunately, he did. "It would be good for the FA to show a bit of clemency and let the players play in the FA Cup final. "The fact we play each other makes it an even decision for me." "We will see if we can appeal because both players apologised to each other and the referee. "I think that the referee understands the situation. He will watch the video again and if he sees something different he will put it in his report. "In this case, with the two teams playing in the final maybe someone can be sensible." West Ham: Walker, Scaloni, Ferdinand, Collins (Fletcher 45), Ward, Etherington, Benayoun (Harewood 77), Mullins, Reo-Coker, Zamora, Sheringham. Subs Not Used: Hislop, Ephraim, Reid. Liverpool: Dudek, Finnan (Hyypia 63), Carragher, Kromkamp, Traore, Cisse, Hamann, Sissoko, Warnock, Fowler (Luis Garcia 80), Morientes (Riise 85). Subs Not Used: Reina, Alonso. Sent Off: Luis Garcia (82).